I finally have my new category of brushes finished. I call them Skip’s Best Thick Paints, and I believe they are my best thick paints. I wanted a set that included stiff bristles and palette knives. I also wanted to create a set that would work well with a new set of papers I designed and offered by Corel called Dynamic Papers. You can get the papers by opening Painter, then go to Help > Welcome > Get More > Dynamic Papers. There is another set available called Natural Papers that look mighty good, too. The following videos will tell you about the brushes, papers, and a paper script library that can be downloaded . The previous post shows some examples of work done with the new variants. This is a work in progress, but will show you how nice the textures can look with these variants and papers. I’m so sorry I haven’t been posting much of late. I spend most of my time managing my sister’s care. She had a stroke about six years ago, but was able to continue living at home with help until April of last year. She cannot walk any more and requires a lot more help. She is now in a nursing home. I live in Georgia, but she is in Mississippi. I spend most of my time in Mississippi these days. I do have my older computer here and can continue painting. 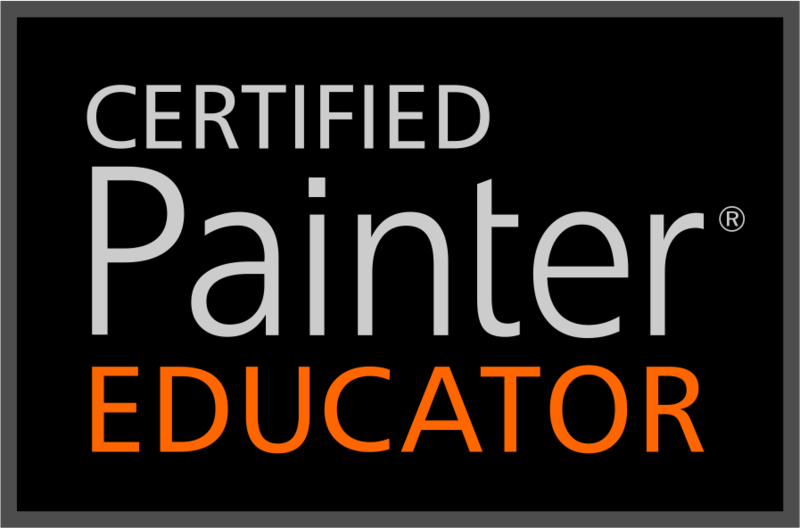 My Painter 2019 class is still available. A few folks in that class requested that I do another Painter brush making class. I did the last one in 2012. I started it last week and hope to have it available in a month or sooner. Lately, thick paint interests me. I have mixed watercolor with thick paint and that has been fun. I want to perfect thick paint and be able to use it in a very thick way. I have made some new brushes that I really like. Some are palette knives but the ones I am liking the most are thick paint variants with very stiff bristles. Here are a couple of examples. The first one started as watercolor washes and then I added thick paint. In the next one, I am using only thick paint and the variants are palette knives. And the last one is also using Thick Paint, but the variants have very stiff bristles. I like this look a lot. When I feel like the brushes are complete, I’ll post them. It has been a while since I have given out any variants on my site. I like how these are looking and hope you do too. Corel officially announced Painter 2019 today and of course, I have a new class showing you the bells and whistles of the new Painter 2019. I call the class A Fresh Start, the New Painter 2019. Register for A Fresh Start, the New Painter 2019. As usual, I offer the class at the Digital Art Academy and you can find the other course offerings here: DAA Courses. You can buy or download your free trial, here: Corel Painter 2019. This year I decided to do something completely different with the class. I am offering a “two-for.” What? In my dictionary, a “two-for” is two classes in one. That’s right? This class will be the usual “What’s New in Painter” class, but I am also adding a beginner’s class, too. I can hear the intermediate and advanced Painter users lamenting, “But I don’t need a beginner’s class; I’m not getting a two-for class.” Technically, you are right, sort of. You are right if you know Painter upstairs and downstairs…every nuisance of the various commands, but do you? I know I don’t. I am constantly going back and re-leaning stuff. Each time I review some function I haven’t used in a while, I think of something new that might be fun to explore with a “Fresh Start.” Get it…A Fresh Start, the New Painter 2019. So, how does this new concept work. Well, there are two separate classes, each with four sessions. New To Painter, NTP, is for the beginners, and Fresh Start, FS, is for intermediate and advanced users. If you consider yourself someone new to Painter, then start with Session 1 of NTP…and follow to Session 2, 3, and 4 of the NTP class. Once finished with Session 4, NTP, then the beginner goes to Session 1, FS, and completes the 4 sessions for FS…thus completing all 8 Sessions. The intermediate and advanced users start with Session 1, FS. And, if the student knows everything to know about Painter, then after Session 1, FS, move on to Session 2, FS. But, and I suspect this but is true for most of us, if you could use a little refresher here and there, then after Session 1, FS, you will go to Session 1, NTP. I’m not expecting you to take Session 1, NTP, the same way someone new to Painter did…no…I am going to give you a special challenge with the material in the various NTP Sessions. For instance, let’s say I talk about auto-painting in Session 1, NTP. Most intermediate and advanced users, might have tried auto-painting a couple of times, but moved on quickly to other parts of Painter. I am guessing, that we…I’m included…didn’t learn a great deal about the various functions of auto-painting when we first explored it. In this class, I am going to go into depth with various features and ask you to revisit the feature and find ways to use the feature creatively. In other words, intermediate and advanced users will complete Session 1, FS, and then move on to Session 1, NTP, as an advanced users, reviewing with skills developed as a long time user of Painter. I promise, to show you some new tricks that are useful. Therefore, the intermediate and advanced user will complete all 8 sessions, too. Check out these two images. I created them using auto-painting only. After I made them, I created papers, flow maps and patterns with them. I made them about 5 years ago, and recently I had to relearn how to do it. It is necessary for me to revisit sections of Painter from time to time, or I forget how to use them. I suspect you are the same…I designed the class for us to revisit stuff long ago abandoned. Of course the class covers all the new features of Corel Painter 2019. I am very excited about the new user interface; I think you will like it, too. There are 36 new brush variants. Using these 36 variants, I created a mini-brush making class. Included are new pattern pen variants. I enjoy playing with pattern pens. Check out these two images done with pattern pens. Can you see evidence of pattern pens in the images? Abstract Red Landscape using Corel Painter Pattern Pens. There is so much more to tell you, so what are you waiting for. Register for A Fresh Start, the New Painter 2019. It is a steal at $55.00 US. Be sure to check other classes available at the Digital Art Academy…All Courses. And Corel Painter 2019 is here: Corel Painter 2019.